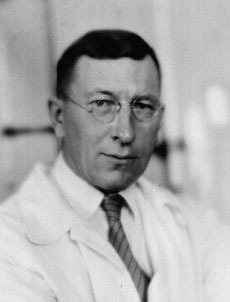 In World War I, Frederick Banting served as a medic and was wounded in battle. He won the Military Cross for continuing to seek out wounded soldiers and administer care under fire, even after he had been shot in the arm. His commendation concluded that Banting's "energy and pluck were of a very high order". After the war he practiced medicine, specializing in pediatric orthopedics. Reading an article about diabetes, he became intrigued. At the time, the only known treatment for the disease's blood sugar imbalance was exercise and dieting, but the prognosis was not good. Diabetes led almost invariably to blindness, amputation of limbs, and early death. Though Banting had no research experience, he went to Physiology professor and diabetes expert John Macleod, offering his ideas for unlocking the secrets of the pancreas, the gland that secretes digestive fluids. The Professor was skeptical, but gave Banting access to his laboratory, where, working with one of Macleod's pre-med students, Charles Best, insulin was isolated in the pancreas of dogs. With help from biochemist James Collip, they devised a method to extract and purify this newly-discovered substance from the pancreas of cattle. They first tested insulin on animals, and then, to establish its safety for humans, Banting and Best injected the fluid into their own veins. Suffering no adverse reaction, they tested it on a 14-year-old boy who had hopeless diabetes, and his condition improved immediately after receiving the injection. Realizing that insulin could be "unspeakably wonderful" as a lifesaving treatment for diabetes, and wanting the medicine to be available at the lowest cost to the most people, all four men agreed not to patent their discovery, a decision which undoubtedly cost them millions of dollars. Within months insulin was being mass produced, and over subsequent decades many millions of lives have been saved. Banting and Macleod were awarded the Nobel Prize in 1923, but Banting felt that Best deserved credit as well, and gave the student half of his endowment. Macleod shared his half of the prize money with Collip. Banting was knighted in 1924, and later researched silicosis and cancer. He also had an intense interest in aviation, and designed the first workable G-suits to protect pilots during high-speed flights. When World War II broke out, Banting returned to military service, and was killed at the age of 49 in an air crash on Newfoundland. Now part of the Town of New Tecumseth, Ontario.